In a few days’ time, our Muslim friends and colleagues here and around the world will gather for Aidilfitri to celebrate the success in observing the fast throughout the month of Ramadan. Sadly, this year’s holy month has also been peppered with violence, tragedies and even famine, in numerous parts of the world, especially in war-torn areas. Many of which are majority-Muslim countries. Closer to home, the 14th General Election saw for the first time in our history, the change of the Federal government. Alhamdulillah, calmness prevailed and the voice of the people was translated into peaceful and smooth transition of power, ushering a new era for Malaysia towards becoming a more mature and vibrant democracy. Muslims must always remember that Islam is a religion of peace, kindness, compassion and forgiveness. These are divine attributes that must always be held in high esteem. As we strive to draw closer to our Creator during Ramadan, we, ourselves must continuously make the effort to become better human beings. Islam teaches us to care. It obliges the strong and wealthy to help the weak and poor without regard for recognition or reward. Indeed, giving is more fulfilling than receiving. That is why I truly believe that charity always starts from home. For Eid, our presence is simply the greatest gift to our family. So let us make time to be with our loved ones and families – forgiving, renewing and strengthening ties. A significant feature of Eid is the generosity and sharing of this special day of rejoicing with not only the poor but also with friends and families of other faiths. In Malaysia, the tradition of having ‘open houses’ has thrived all these years for various festivals. This is a true hallmark of diversity and showcases our respect for others within our society, ensuring we live peacefully together. This we must never take for granted. In PETRONAS, generosity is a culture that is deeply embedded, and one that PETRONAS was founded upon. Our Amanah as custodian of the country’s oil and gas resources is to ensure a sustainable source of revenue for the development of the nation. In giving back to communities, it is our calling in creating avenues to continuously improve the quality of life around us. For this Eid, let us embrace the spirit of fitrah by going back to our Shared Values to ensure that we collectively stay true and steadfast towards the cause of PETRONAS. The journey must continue. I believe, the right tracks have been laid down before us and I am confident, with our Cultural Beliefs, we have the right foundation to continue growing PETRONAS to greater heights. I am thankful to the Almighty as I have been blessed with the opportunity to serve and to be associated with PETRONAS, which insya Allah will be exactly 6 years this month. 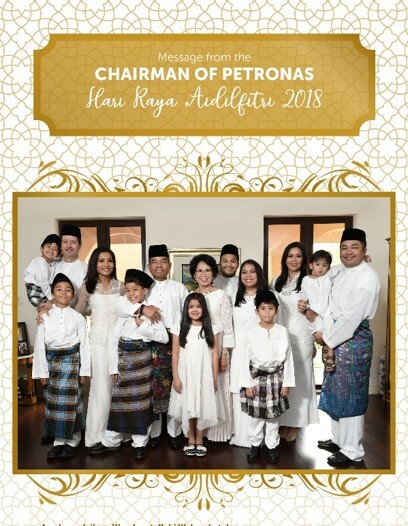 Finally, my family joins me in wishing everyone in PETRONAS, wherever you are, a happy and joyous Selamat Hari Raya Aidilfitri, Maaf Zahir dan Batin. Safe travels and take the time to rest between your hectic travels. We humbly seek your forgiveness for any shortcomings on our part.